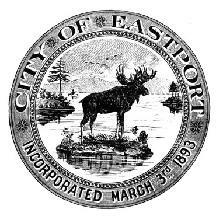 The City of Eastport, an island historically known as Moose Island was settled in 1772. It was organized as a city in 1798 as part of the Commonwealth of Massachusetts. Eastport was seized by the British in the War of 1812 and held for several years (1814 - 1818) during which time it was considered part of New Brunswick. Returned to the United States in 1818 by the Treaty of Ghent, it was the last United States land held by Great Britain. In 1820, what is now Maine was split from the Commonwealth of Massachusetts and became the State of Maine. Eastport grew as a border trading (including smuggling), shipping and shipbuilding town. In the 1870's sardine packing began in Eastport and by 1882 the city had 18 sardine factories. With its thriving industries, Eastport grew to a population of 5,311 people by 1898 and at the time had five ship chandleries of which S. L. Wadsworth & Son was one of the two located on Central Wharf. During this time, Eastport was thought to be one of the busiest shipping ports in the US. In June of 1916, a flotilla of 23 US Navy ships visited Eastport and anchored in Passamaquoddy Bay. Through fires, storms and other disasters, Eastport changed and so did its commerce. In 1935, the US Army Corps of Engineers began a $30 million project to harness the tides, known as the Passamaquoddy Tidal Power Project. Political problems with Canada stopped the project in 1936. In 1998, Eastport dedicated a new cargo pier making the City home to the deepest water cargo port (natural depth without dredging) in the lower 48 states. Eastport, Maine is the easternmost city in the United States with a current population of around 1,900 people. It is a maritime city, known for its deep water, 28 foot rise and fall of tides and home to Old Sow, the hemisphere's largest whirlpool. Downtown Eastport is located at the terminus of Route 190, and proceeds about four blocks along the waterfront. Twenty-nine historic commercial buildings, mostly red brick built in 1887 after the �Great Fire� are listed on the US Department of Interior�s National Historic Register. These buildings, located in the heart of the city comprise the Downtown Historic District along with 20 or so additional newer buildings located on the periphery of the Historic District. The City has many other homes and historic buildings which were built in the mid and late 1800�s. Six additional buildings in town are also listed on the National Historic Register. 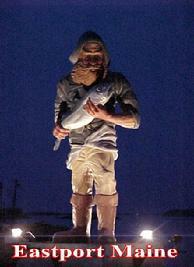 Eastport Fisherman Statue across from Wadsworth's built by FOX for the 2001 filming of their series "Murder in Small Town X"
The entire downtown is located along the waterfront with its red granite sea wall and beautifully lit pedestrian walkway. Within this downtown waterfront, there are two piers, one known as the Breakwater and the other, the Fish Pier. These two piers create a protected harbor for the local fishing fleet, a base for the local US Coast Guard Unit, protected tie ups for the two commercial tugs which service the shipping industry in the area, and guest boat docking for visitors. The ocean views from the downtown waterfront are of Passamaquoddy Bay and Campobello Island and its Roosevelt Cottage, summer home to President Franklin D. Roosevelt and now an International Park. Four lighthouses are visible from various vantage points: East Quoddy Light, West Quoddy Light, the Lubec Spark Plug Light and Mulholland Light. Each August whales surface to feed in front of the East Quoddy Lighthouse at the mouth of Passamaquoddy Bay. The �Old Sow� whirlpool located just north of the downtown. A museum with the model of the abandoned Passamaquoddy Tidal Power Project helps demonstrate the great powers of the tides and currents created by the tidal changes. Eastport is serviced in the summer by a car ferry to Deer Island, New Brunswick, Canada which provides connecting service to Campobello Island and mainland Canada. The City has an excellent regional airport right on the island and numerous parks and recreation areas. 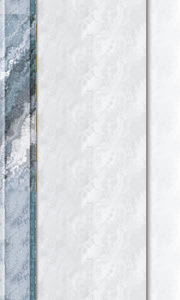 For information on Eastport please visit the Eastport Area Chamber of Commerce. S. L. Wadsworth & Son, Inc. is located downtown across from the Fish Pier (and its former Central Wharf location) and is open Six days a week from 8:00 am to 4:30 pm. The store has a wall displaying pictures of each Wadsworth family proprietor over the years, as well as many historical pictures of Eastport and Central Wharf. The store carries a line of "Nation's Oldest Ship Chandlery" logo active wear and other items celebrating its history. Stop by and say hello to Chris & Scott Brown, Alan Foster, Jim Whitehead, Randy Minard, Winnie Higgins, Carolyn Lowe, Maureen Small, Davis, Mark and Kate Brown.